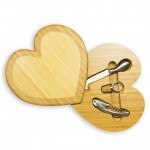 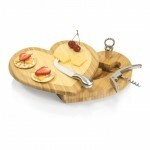 The Heart cutting board and tool set is so elegant in its simplicity and design, it bodes well no matter the occasion_a romantic evening for two, a festive party, or special get-together. It makes a delightful gift for couples at any stage of their relationship, or for individuals with an affinity for things heart-shaped. 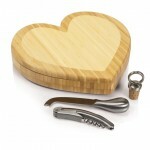 If you're looking for a unique gift idea for your spouse, the Heart, being made of wood, fits the bill for both the traditional and modern lists of wedding anniversary gift ideas...5th year for traditional, 6th year for modern.